The only Greek island group not in the Aegean, the Ionian islands lie just off the west coast of Greece, in the Ionian Sea, at the entrance to the Adriatic. They're believed to be the tips of a submerged mountain chain that runs from the Adriatic to the Peloponnese. All are lush, mountainous, green (they get lots of rain in winter) and lovely. They look less typically Greek than other islands - in fact they feel more Italian, with their slender cypress trees and old Venetian buildings in shades of pink and ochre - and they have a softer light than the brightness of the Aegean. Everywhere there are deep green pine forests, olive and citrus groves and vineyards, and the displays of wildflowers- anemones, irises, daisies, orchids - are beautiful in spring, especially in Corfu. The islands largely escaped Ottoman occupation, but were instead invaded by the Venetians and the British, both of whom left their mark in a variety of ways, from architecture to cricket, sewers to ginger beer. There's not the same wealth of archaeological remains here that you'll find elsewhere in Greece, but the mythological connections are many. The Ionians are thought to get their name from the Greek goddess Io, one of Zeus's paramours, who passed over here in flight from his jealous wife Hera. The island of Ithaca was famously home to Odysseus, he built his ships on Kefallonia, and Corfu was his last stop on his long journey home. The Odysseus connection is reflected in a large number of bars, restaurants and streets named after him throughout the islands. Tourism is well established here, especially on Corfu, which was one of the first (and is still one of the most popular) Greek islands to attract the British package holiday market. Zakynthos, and to a lesser extent, Kefallonia and Lefkada, also have some large tourist developments, but there are plenty of quieter pockets for those who don't want to join the party crowds. Best known, northernmost and greenest of the Ionians, Corfu (or Kerkyra) is also considered by many to be possibly the most beautiful of Greek islands. It has inspired many artists over the years: Goethe, Oscar Wilde, Gerald and Lawrence Durrell, Alfred Sisley and Edward Lear all painted or wrote about it. It's certainly the most developed island, and is hugely popular with the British: half a million of us flock there every summer. However, 80 per cent stick to 20 per cent of the coastline, so you can always find somewhere quiet. It has an attractive, cosmopolitan capital city in Corfu Town, and over 100 miles of coastline, with dramatic cliffs and beaches (both pebbly and sandy), and famously lovely bays and grottoes near Paleokastritsa. Inland, there's plenty to attract walkers, ornithologists and botanists - in spring the wildflower displays are particularly impressive. 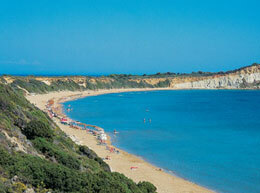 Also renowned for its beauty is Zakynthos (or Zante), most southerly of the Ionians. The Venetians called it "the flower of the Orient". Almost triangular in shape, the island has two green mountainous promontories extending into the sea to form the huge bay of Laganas, an area that's been rather overdeveloped by tourism. The main town (Zakynthos Town) was destroyed by an earthquake in 1953 and since rebuilt - so there's not much to see there. However, the countryside is pretty, with pine-covered mountains and hills in the north, a gentle, lush centre (where currant vines, olive trees, almonds and vegetables are grown), and dozens of sandy beaches. Zakynthos is also famous for its caves and excellent diving opportunities. Largest of the Ionian Islands and (prior to the success of Louis de Bernières' best-selling novel Captain Corelli's Mandolin, at any rate) the least developed, Kefallonia has dramatic scenery, wonderful beaches and strong traditions. The pretty fishing harbour of Fiskardo in the north, with its Italianate houses, is a busy summer resort and there are picturesque Venetian fortresses at Kastro and Assos (the latter with great views down over the bay of Myrtos, renowned for its afternoon sun and soft white sand). There are wonderful views, too, from Mount Enos, 5,340ft/1,628metres above sea level, looking out over the island and its neighbours. 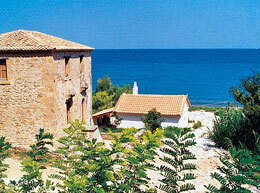 The island is known for its wine, olives and olive oil, and, like Zakynthos, famous for its caves. On the northwest coast it's possible to spot monk seals, rarest of the seal species and highly endangered, mainly because of habitat disruption caused by the tourist trade. Across a narrow strait to the east of Kefallonia lies Ithaca (or Ithaki), famously home of Odysseus. Small, sleepy and peaceful, it has no airport, no big modern hotels (the lack of great beaches means it's not very touristy, and visitors should book ahead if they intend to stay), and no swimming pools (water's in short supply). 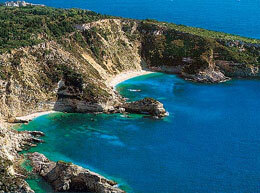 However, it has lovely scenery and is the most mountainous of the islands. 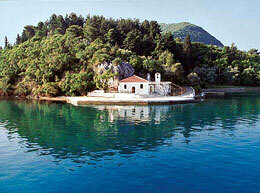 The capital of Ithaki (or Vathi) lies at the end of a deep fjord-like bay, with a spectacular harbour approach. Homer fans can explore a number of Odyssey sights, including the Cave of the Nymphs, where it's said that Odysseus hid the gifts bestowed upon him by King Alcinous when he finally returned home long after the end of the Trojan War. Tiny but perfectly formed, Paxos (or Paxi) is the smallest of the major Ionians and one of the smallest of all Greek islands. Very simple and undeveloped, it's the place to come if you want a really quiet holiday. At the same time, it's upmarket and expensive, with a roster of celebrity regulars. Thick with grapevines and olive trees (it's a good place to pick up olive oil). Paxos has wonderful beaches and translucent waters, and the gorgeous west coast is lined with spectacular cliffs and grottoes accessible only by boat. 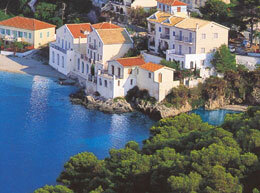 The villages of Gaios (the capital), Lakka and Longos are all picturesque and charming. The neighbouring tiny island of Antipaxos (Antipaxi) is a quick boat-ride away - go for the beaches and a wander through its renowned vineyards. Barely an island at all (it's linked to the mainland by a causeway at the north), Lefkada is green, fertile and deeply traditional at heart - in the inland villages you'll still see old women sitting on doorsteps making lace and old men hanging out at the kafeinion. The island is busy with Greek and Italian holiday-makers in mid-summer, and popular with windsurfers who come on pilgrimage to Vassiliki. It has a picturesque capital in the form of Lefkada/Lefkas Town, with its distinctive multicoloured wooden houses, and a popular holiday spot in Nidri, on the east coast. From Lefkada, it's easy to drive to the attractions of Epirus on the mainland, and off the southeast coast is the small island of Meganisi with its beautiful beaches. Isolated from the rest of the Ionians, round the corner of the Peloponnese, Kythira looks different to the other islands (more like the Cyclades, in fact) although it shares historical rule from Venice and Britain with the rest of the Ionians. All Rights Reserved. No part of this web site may be reproduced without permission.